One thing I love to do to stay cozy in the winter months is crochet. I’ve been working on a crocheted mixed-stitch blanket ala Little Woollie. 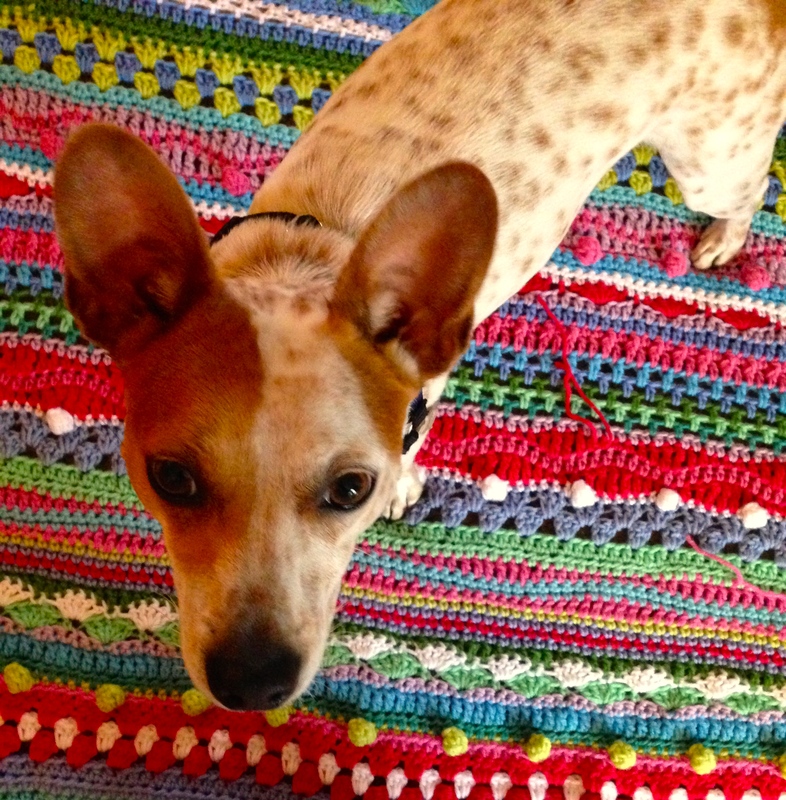 Mine is shown here, with modeling help from Lil’ Pupper who loves crocheted blankets. He likes to get under them and then stick his nose and teeth through the holes, wrestling and growling like he’s a scary monster. 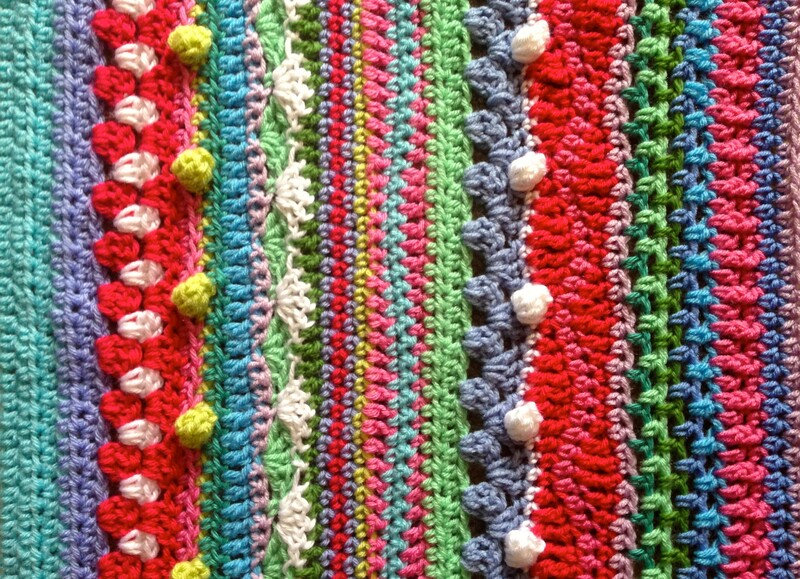 Anyway, I really like littlewoollie.blogspot.com and was especially enamored with her mixed-stitch stripey blanket. It’s kind of free form, and you know, I love free-form anything. I really want to add some Catherine Wheels, but I’ve been feeling lazy and just doing EASY stitches. I have to say, I think I love lazy-easy more than I love Catherine Wheels. Well, that’s me, at least that’s me now. Who knows maybe I’ll feel adventurous and complicated tomorrow. This entry was posted in crafting, dogs, pets, photo 101, photography, simplicity, thinking and tagged art, craft, crafting, crochet, dogs, ease, meditation, pets, photo 101, photography, photography101 by Project Easier. Bookmark the permalink. I love this! I came back to look at it twice… thinking, “I simply cannot start another project right now!”… hmm… maybe I CAN? I haven’t crocheted in a million years, but my grandmother taught me well when I was a teenager. I still have her little book of stitch descriptions; it’s very dated with 1970’s appeal, but the stitches themselves never go out of style. I love the Mexican blanket look you have here. You’ve got me thinking! It’s super fun and easy and looks just 70s enough for my rainbow-freak inner child (but not so much that I’m on the road to crocheted toilet paper covers in the shape of ball gowns, God forbid!). You definitely should do one! I adore this blankie. Luurve it. And as another who lived through the seventies, I have to say this is far superior to anything I remember.